Quito (official name: San Francisco de Quito) is the capital city of Ecuador in northwestern South America. It is located in northern Ecuador (see NG MapMachine satellite map) in the Guayllabamba river basin on the eastern slopes of the Pichincha ( 15,728 ft; 4,794 m), an active stratovolcano in the Andes mountains. The city's elevation is 9,300 ft (2,850 m) above sea level (measured at the Plaza de la Independencia), making Quito the second highest capital city in the world. The city's population according to the most recent census ( 2001) was 1,399,378. In 2005, however, the estimated population was 1,865,541 (canton). The area of Quito is approximately 112 square miles (290 km²). There is some confusion about Quito's position as the second highest (elevation) capital in the world, but La Paz, Bolivia, which is where the Bolivian government functions, is the governmental capital of Bolivia. Sucre is the legal capital of Bolivia. Due to its altitude and location, the climate in Quito is mild to cool, fairly constant all year round, with a high temperature typically around 67 degrees Fahrenheit (20° C) on any given day, and a low around 49 degrees Fahrenheit (10° C) at night. The city experiences only two seasons: summer (the dry season) and winter (the rainy season). Picture of 'Iglesia de Santo Domingo' at night, one of the many beautiful churches and monasteries built by the Spanish during the Colony. This church is one of the most photographed churches in Quito and is locally known as Iglesia de San Francisco (named after Francis of Assisi). 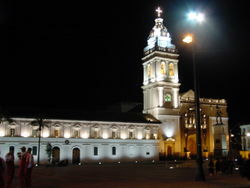 The main cathedral of Quito is about two blocks northeast from San Francisco. Quito's origins date back to the first millennium, when nomadic tribes roamed the area and ultimately formed a commercial centre where Quito is currently located. Early in the 16th century, the Incas conquered the city, hoping to further the reach of their kingdom, but upon the arrival of the Spanish in 1533, those plans were abandoned. Rumiñahui, an Inca war general, burned the city to prevent the Spanish from taking it, thereby destroying any traces of the prehispanic city. Indigenous resistance to the Spanish conquest continued during 1534, with Francisco Pizarro founding San Francisco de Quito on August 15 of that year. On December 6, 1534 , the city was officially founded by 204 settlers and Sebastián de Benalcázar, who captured Rumiñahui and effectively ended organized resistance. Rumiñahui was then executed on January 10, 1535. On March 14, 1541, Quito was named a city, and on February 14, 1556, was given the title "Muy Noble y Muy Leal ciudad de San Francisco de Quito" ("Very Noble and Loyal City of San Francisco of Quito"). 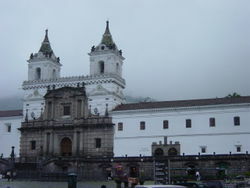 The Spanish promptly established the Catholic religion in Quito, with the first temple (El Belén) built even before the city had been officially founded. On January of 1535, the San Francisco Convent was constructed, the first of about 20 more churches and convents built during the colonial period. The Spanish heavily evangelized the indigenous people and also used them as free labor for construction, especially in the initial stages. The Diocese of Quito was established in 1545 and was elevated to the Archdiocese of Quito in 1849. 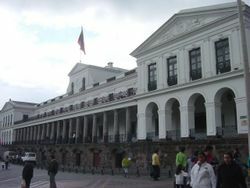 In 1809, after nearly 300 years of Spanish colonization, Quito was a city of about 10,000 inhabitants, and on August 10, 1809, it was there where the first proclamation of independence was heard. The movement was ultimately defeated on August 2, 1810, when Spanish forces came from Lima, Peru, and killed the leaders of the uprising and about 200 inhabitants of the city. A chain of conflicts concluded on May 24, 1822 when Antonio José de Sucre, under the command of Simón Bolívar, led troops into the Battle of Pichincha. Their victory marked the independence of Quito and the surrounding areas. Just days after the Battle of Pichincha, on May 24, 1822, the leaders of the city proclaimed their independence and allowed the city to be annexed to the Republic of Gran Colombia. Simón Bolívar went to Quito on June 16, 1822, and was present at the signing of the Colombian Constitution on June 24, 1822. This lasted until May 13, 1830, when Gran Colombia dissolved and the nation took the name Republic of Ecuador, becoming an independent nation. Quito was named the country's capital for being the original home of numerous prehispanic cultures, for its role in the independence of Ecuador, and because it was an important administrative seat. Quito has been the scenario for demonstrations and political violence since the early years of the republic. In 1833, members of the Society of Free Inhabitants of Quito were assassinated by the government after they conspired against it, and on March 6, 1845, the Marcist Revolution began. Later, in 1875, the country's president, Gabriel García Moreno, was assassinated in Quito. Two years later, in 1877, archbishop José Ignacio Checa y Barba was killed by poisoning. In 1882, insurgents arose against the regime of dictator Ignacio de Veintemilla. Their victory did not end the violence that was occurring throughout the country. On July 9, 1883, the liberal commander Eloy Alfaro participated in the Battle of Guayaquil, and later, after more conflict, became the president of Ecuador on September 4, 1895. Upon completing his second term in 1911, he moved to Europe, but upon his return to Ecuador in 1912 and attempted return to power, he was arrested on January 28, 1912, thrown in prison, and assassinated by a mob that had stormed the prison. His body was dragged through the streets of Quito to a city park, where it was burned. In 1932, the Four Days' War broke out, a civil war that followed the election of Neptalí Bonifaz and the subsequent realization that he carried a Peruvian passport. Workers at a major textile factory went on strike in 1934, and similar unrest continues to the present day. On February 12, 1949, a realistic broadcast of H. G. Wells' novel The War of the Worlds led to citywide panic and the deaths of six people who died in fires set by mobs . In recent years, Quito has been the focal point of large demonstrations that led to the ousting of presidents Abdalá Bucaram ( February 5, 1997), Jamil Mahuad ( January 21, 2000) and Lucio Gutiérrez ( April 20, 2005). 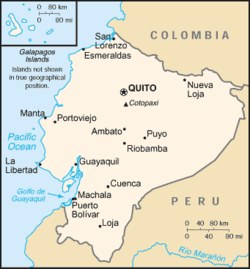 Quito is located in the northern sierra of Ecuador in the Guayllabamba river basin. The eastern part of the basin is sorrounded by a number of volcanoes: Cotopaxi, Antisana, Sincholagua and Cayambe (volcano) to the east; Illiniza, Atacazo, Pichincha and Pululagua to the west. The Guagua Pichincha, located only 13 miles (21 km) west of Quito, presents some ongoing volcanic activity and it undergoes constant monitoring. Its last major eruptive activity was recorded on October 5 and October 7, 1999, when a large amount of ash deposited on the city caused significant disruption, including closing of the international airport. The worst event occurred in 1660 when over 10 inches (25 cm) of ash covered the city. Quito is the only capital in the world to be directly menaced by an active volcano. Activity in other nearby volcanoes can also affect the city; in November 2002, after an eruption in the volcano Reventador, the city was showered with ash (more than in 1999) for a few days. The region is also vulnerable to earthquakes. The worst known earthquake to have hit Quito occurred in 1797 and killed around 40,000 people. The most recent major seismic event, with a magnitude of 7 on the Richter scale, occurred on 1987 with an epicenter about 50 miles (80 km) from the city, and it killed an estimated 1,000 in Ecuador. Quito buildings suffered minor damage. On October 16, 2006, the city felt a quake measuring 4.1 on the Richter scale. No major damage was reported. See also Cantón Quito (= "Distrito Metropolitano de Quito"). the southern part is mainly industrial and residential, a working-class housing area. The northern part is modern Quito, with high-rise buildings, shopping centers, the financial district and upper class residential areas. Mariscal Sucre International Airport is in the northern part. As of the October 2004 political elections, Quito was divided into 19 urban electoral parishes (parroquias electorales urbanas). These parishes are not the same as the municipal parishes, whose boundaries are determined by the municipality of Quito instead of electoral organizations. Partial view of northeastern Quito. The buildings on the topmost part of the photo are on the residential avenue named Avenida González Suárez after former Quito archbishop Federico González Suárez. 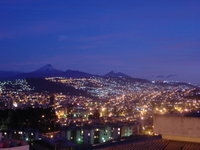 Quito at dusk. In the background, from left to right, are the volcanoes Cotopaxi, Pasochoa and Rumiñahui. Northern part of Quito, seen from the northeastern side of the Pichincha volcano. 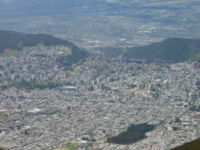 The northern part of Quito is where the main business district of the city is located. It also contains upper-middle class neighborhoods and a substantial number of buildings. It is also where the international airport and major recreational areas are located. 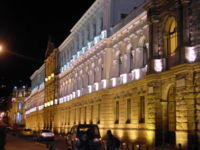 This museum is a comprehensive showcase of Ecuadorian art, history and culture. On the ground floor it has an extensive collection of pre-colonial (including pre-Incaic) potteries, sculptures, gold, lithics, and even a mummified body. There are also some remarkable but somewhat distorted models that help evoke the way various parts of Ecuador must have looked like, from the Pambamarca fort to the Cochasquí tumuli complex. The highlight of this collection is a golden sun mask of the La Tolita culture. The second floor is dedicated to Colonial art; several paintings and sculptures with religious themes are in exhibition. The third floor is devoted to contemporary Ecuadorian art. Parque Metropolitano , with its 1,376 acres (5.57 km²) is the largest urban park in South America. (As reference, New York's huge Central Park is 843 acres (3.4 km²) large.) The park is located in the north of Quito, on the hillside, behind the Atahualpa Olympic (Soccer) Stadium. The park is suited for mountain biking, walking, or running. Most of it is eucalyptus forest with trails. There are many sculptures on display for the public. The park has 4 sites that can be used for picnic or BBQ. The eastern part of the park has a view of Cotopaxi, Antisana and the Guayllabamba river basin. La Carolina is a 165.5 acre (670,000 m²) park located in the Benalcázar parish in the middle of Quito's business and shopping district, between the avenues known as Avenida Amazonas, Avenida Shyris and Avenida Naciones Unidas. Quiteños gather at La Carolina mostly on weekends to play fútbol (soccer), básket (basketball), ecua-volley (an Ecuadorian variation of volleyball with less emphasis on spiking to score; more of a throw and it allows using your feet like soccer), doing aerobics, flying kites, running, snacking or just observing the thralls of people just walking around. The southern part of the park has a small pond where paddle boats can be rented, and a skatepark for bicyclists and skateboarders. Artists are known to perform on weekends at the park. In the western part of the park visitors will find the Quito Exhibition Centre with different exhibits every month, the Quito botanical gardens and a Vivarium. El Ejido is the park situated between the old part of the city and the modern section. This park is known for handicrafts available for sale every Saturday and Sunday. Local painters sell copies of paintings by Oswaldo Guayasamín , Eduardo Kingman or Gonzalo Endara Crow. Otavaleños sell traditional sweaters, ponchos, carpets and jewelry. La Alameda park has the oldest astronomical observatory in South America. The park has a monument of Simón Bolívar and a small lake where boats can be rented. The "centro histórico", historical centre, as it is called, was appointed , along with the historic centre of Kraków (Cracovia) , Poland, as the first UNESCO World Heritage Cultural Site in 1978 and has many appealing plazas (the Independence Plaza being the most important) and manierist and baroque churches, including the Cathedral, the convent and church of St. Francis, which is the largest building of the Colonial era built by the Spaniards in South America, the church of El Sagrario, convent and church of Santo Domingo and the church of the Society of Jesus, or "La Compañía" which was built after the model of the Church of the Gesu in Rome. There are also several museums, many of them dedicated to Colonial art and history; some of the most renowned are the City Museum ("Museo de la Ciudad") , the Metropolitan Cultural Centre and the museum of the Convent of St. Francis. Markets are scattered throughout the area. El Panecillo is a hill located in the middle of the city with an altitude of about 9,895 feet (3,016 m) above sea level. The monument to Virgin Mary located on top of El Panecillo is visible from most of the city of Quito. This monument is based on a sculpture made by Bernardo de Legarda in the Spanish Colony time known as 'La Virgen de Quito'. In 1976, the Spanish artist Agustín de la Herrán Matorras was commissioned by the religious order of the Oblates to build a 134½ foot (41 m)-tall aluminium monument of a madonna which was assembled on a high pedestal on the top of Panecillo. It is made of seven thousand pieces of aluminium. The monument was inaugurated on March 28, 1976, by the 11th archbishop of Quito, Pablo Muñoz Vega. The virgin stands on top of a globe and stepping on a snake, which of course is classic madonna iconography. What is not so traditional is that she has wings. The people of Quito proudly claim that she is the only one in the world with wings like an angel. The monument, was inspired on the famous "Virgen de Quito" (Quito's Madonna) also known as "the dancer" sculpted by Bernardo de Legarda in 1734, which now decorates the main altar at the Church of St. Francisco. This madonna represents a turning point of the Quito School of Art (one of the most renowned of the Americas) because it shows a virgin with great movement that is practically dancing as a contrast with the traditional static madonnas that were produced during the 18th century. Northern Quito as seen from the TelefériQo (Aerial tramway) Station at Cruz Loma (part of the Pichincha mountain complex at about 13,123 ft; 4,000 m, ). Lots of buildings (10 or more stories) have been constructed around the financial centre of the city throughout the last 35 years. Since July 2005, Quito has an aerial tramway, known as the " Telefériqo," from the city centre to the hill known as Cruz Loma on the east side of the Pichincha volcano. The ride takes visitors to an altitude of about 12,000 feet (over 4,100 m) where they find a number of restaurants, coffee shops and stores of different kinds. The temperature there is many degrees cooler than in Quito itself. There are also trails for hiking. Besides the aerial tramway to Cruz Loma, the Telefériqo as a whole is a visitor centre that includes an amusement park ( Vulqano Park), fine dining restaurants, Go Karts, Paint Ball, shopping malls, extensive food court, and other attractions. La Mitad del Mundo (the middle of the world) is a small village administered by the prefecture of the province of Pichincha, and is located about 22 miles (35 km) north of Quito, on the equator, where visitors find a monument to the equator housing a historical museum, in addition to a planetarium, various exhibits, and shops. Quito Zoo located near the village of Guayllabamba, about 12 miles (20 km) outside Quito, has the biggest collection of native fauna in Ecuador, including several animals recuperated from the illegal fur trade.